While technical skills and business acumen are both essential to a project’s success, the interpersonal aspect of project management is often overlooked by even the most successful project managers. In an effort to better understand the cultures and personalities of our clients, we created the framework known as A Sixth Sense for Project Management®. Combining our strategy with our technical skill and business acumen, we have the perfect three-pronged approach for 360 degree project management. 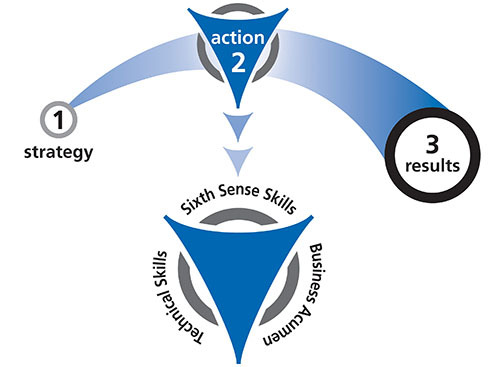 A Sixth Sense for Project Management is a formula carefully developed to ensure maximum success in project management. It adds the important human side of project management to the mix, allowing us to interact with stakeholders in an effective and personal manner. By acknowledging that organizations are comprised of people with opinions, likes and dislikes, and individual goals, we plan and execute a project while keeping as many parties as possible on our side. During and after the process of developing A Sixth Sense for Project Management, our founder, Tres Roeder authored two original books on the topic of effective project stakeholder management under the framework of SSPM. For more information or to purchase these pioneering works in the project management industry, head to our Books page or visit our store page.